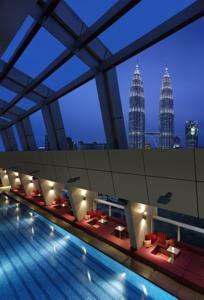 Enjoying direct access to Suria KLCC and Petronas Twin Towers, the luxurious Traders Hotel offers a 24-hour gym and rooftop pool. Free Wi-Fi is available, including in the airport shuttle service limousine. Traders Hotel Kuala Lumpur offers free shuttle buggies to Suria KLCC Shopping Mall. It is about 30 miles from Kuala Lumpur International Airport. Royal Selangor Golf Club and Pavilion Mall are both less than one mile from the hotel. The spacious rooms feature floor-to-ceiling windows with views of the cityscape. 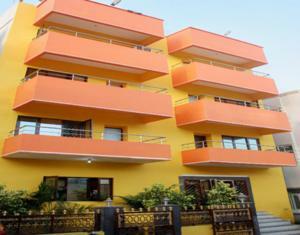 Each room includes a flat-screen cable TV and tea/coffee making facilities. Guests can relax in theSPA’s steam bath and hot tub. There is a mile long jogging trail around KLCC Park. The hotel also provides a business center and free parking. Gobo Chit Chat Restaurant serves both Western and Asian specialties. Succulent steaks can be enjoyed at Gobo Upstairs Lounge & Grill. The open-air Sky Bar offers cocktails. Rooms: Hotel Rooms: 571, Hotel Chain: Shangri La. Free! Wi-Fi is available in the hotel rooms and is free of charge. Free! Wi-Fi is available in all areas and is free of charge. Free! All children under 12 years stay free of charge when using existing beds. Free! One child under 2 years stays free of charge in a baby beds. One older child or adult is charged MYR 65 per person per night in an extra bed. The maximum number of extra beds/baby beds in a room is 1. Any type of extra bed or crib is upon request and needs to be confirmed by management. Supplements are not calculated automatically in the total costs and will have to be paid for separately when checking out.